Summary: Would you prefer reading a satirical work by a stinkingly rich female celebrity with lots of first-world problems, which I am sure you won’t be able to relate to but still find a brief, humorous, witty read in them? The answer is all up to your taste. My take: I must say Twinkly Khanna has a long way to tread on to finally reach what they call a place from where the zenith of good language and sense is visible, but she has given the journey a nice kick start. It is apparent from her columns in popular newspapers and magazines that she almost, always carries an opinion about things and the fact that she is THE wife of an extremely popular Bollywood star doesn’t really brush off her shoulder and, thus, grants her an easy access to the ‘stardom’ despite having left the Bollywood industry decades back. I especially liked the sub-title of the book, She’s Just Like You and a Lot Like Me and the reason why I thought it was catchy was the way the author has tried to relate herself to her readers, simultaneously drawing a clear line of already-apparent distinction. Besides, the cover of the book has pretty much summed up all the topics she discusses about in the book – her prodigal son, the man of her house (the subtle hint she has dropped by depicting a dumb bell), her baby and the diapers and (the local) herself. The TOC might seem to be a sneak peek into the detailed diary entries the author might have written trying really hard to take humor out of her routine and boy! she has been successful in making her readers smile. The language of the book is rather conversational with a lot of use of colloquialism and personal pronouns. I think it perfectly fits the bill, for she’s sticking to the ‘entertainment, nonfiction’ genre, which is mostly liked by a wider range of readers. You would also find sketch quotes at the beginning of each chapter, consisting of witty, humorous messages which would instantly set your mood right for the coming chapter. For instance, there’s one which said, ‘nothing is free except bad advice’ and there’s this other which I loved, ‘I want to be a child again, to climb up hills and roll down the other side, only because the hill exists and so do I’. Halfway through, you might also find this book a rant diary of a frustrated wife, daughter and mom, but nevertheless, the account would still continue to interest as well as amuse you. Final word: This one is a 240-page, brief read which will surely keep you glued until you reach the last page and would also make you laugh occasionally along the way. 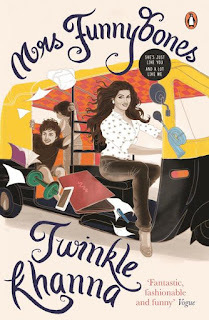 Read it if you love Twinkle Khanna and her personal views which comfortably glide into popular national media every week and, also, if you generally hear your thoughts flowing coherently with hers. Thanks, darlings, Tina and Anjali. I'm sure you are going to find this as an easy-to-digest, hilarious read. :) Happy reading! Nice review. I hope this book meets my expectations. Thanks so much for your lovely words, Sinjini! Already checking your wonderful writings out. Happy reading!